While most people know that sugar causes tooth decay, many people don’t completely understand how exactly that works. And they also often don’t realize how much sugar they’re really consuming. Here at Smile Town Burnaby, we believe that moderation is the key to a healthy diet. This is true both in terms of overall health, and dental health. While we are careful to warn of the dangers of sugar when it comes to oral health and cavities, we realize that it isn’t realistic (or even healthy) to cut sugar out of your diet completely. For most people, sugar is a necessary part of daily eating habits. And besides, one of the pleasures of life is an occasional sweet treat! So instead, we suggest that our patients enjoy sugar in moderation, and that they’re extra careful to clean their teeth after indulging. The problem is, many people don’t realize just how much sugar is present in the foods they eat every day, and so many of us are overindulging in sugars without realizing it. Sugar, as most of us know, causes cavities. But that’s not the whole story! The bacteria that live in our mouths feed off of sugar, and when they do, they produce acids. It’s actually these acids that cause cavities, because they eat away at the enamel and dentin of your teeth. In short, sugar + bacteria = acid… and acid causes cavities! Dietary sugar can of course be found in things like cake, candy, gum and other sweet treats, but these days, sugar seems to be an ingredient in almost everything else, too! Next time you’re at the grocery store, make a point of reading the ingredient lists of some of the packaged foods you buy. You’ll find sugar in everything from bread and dairy products, to packaged dinners and canned tomato sauce, and everything in between, too! 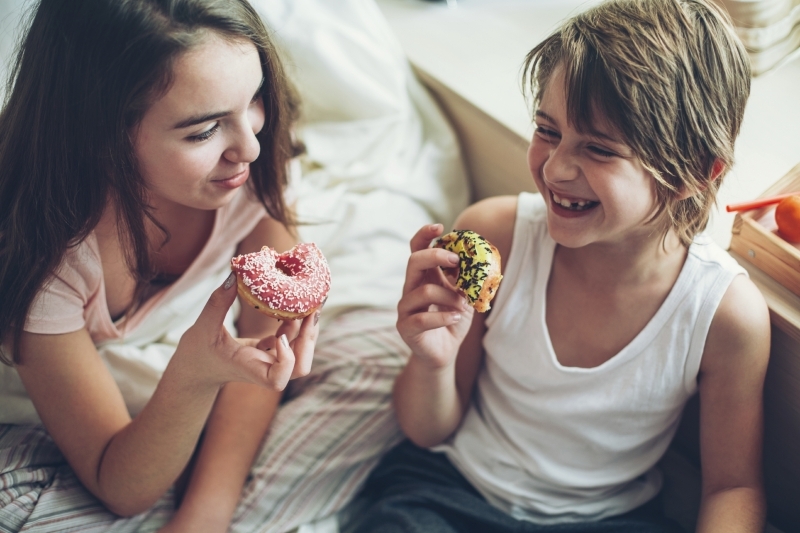 Luckily, with a few precautions, you can takes steps to avoid unnecessary dietary sugar, and save your kids’ sugar consumption for when they want a treat! As mentioned above, take some time to read ingredients lists while you’re shopping, and familiarize yourself with the products and brands contain more sugar, and those that contain less. You may find that simply switching out brands can cut down your family’s sugar consumption significantly. Turns out, there’s more than one way to say ‘sugar’. There are multiple words that mean sugar, and some brands are sneaky and try to disguise the large amounts of sugar in their food products by naming all the different types they use separately. There are also many other words that mean sugar in addition to these, so before your next trip to the store, print off a list of them, and don’t be fooled! Although processed foods are very convenient, we do pay a price for that convenience. Processed foods can be quite high in sugar (even seemingly innocuous ones like the canned tomato sauce mentioned above), and so whenever possible, aim to cook your own food from scratch. This is probably the best way to avoid unnecessary dietary sugar, because you’ll know exactly what ingredients and how much of each you’re adding to your dish. Contact Smile Town Burnaby today for more tips and advice on avoiding dietary sugar.